Dr. Galyna Kufryk, a professor of biological sciences in the College of Science, Engineering and Technology, was invited by the Institut Pasteur in Paris to continue her research of tiny photosynthetic organisms that someday could help solve the world’s energy crisis. You can read more about Kufryk, who received the Distinguished Faculty Scholar Award last year from CSET, and her work in this GCU Today story. One of the many bright new freshmen who started classes three weeks ago is Yousif Al Dulaimi, a pre-med biology major who grew up in Baghdad, Iraq, amid Saddam Hussein’s ouster and his country’s war. 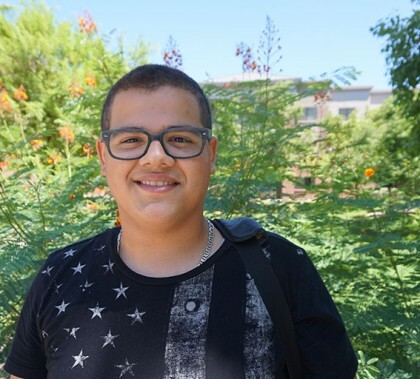 Yousif arrived in Chandler with his family about 14 months ago, enrolled in and graduated from Hamilton High and now is taking five courses and working two jobs. This week’s Antelope Intros feature two former GCU students, one who appeared on a popular game show and another who hasn’t been afraid to take divergent career paths and test her considerable skills in a number of areas. The number of students in the Colangelo College of Business has almost doubled in just two years, and with that growth have come even more opportunities to get involved in programs and clubs on campus and in roles in the business community. The faculty is focused on facilitating those opportunities, Dean Dr. Randy Gibb emphasized at the CCOB kickoff event Wednesday morning. GCU Today has the story. The new GCU Lope Shop opened for business at 8 a.m. Wednesday to brisk sales and rave reviews. Students were snapping up T-shirts, mugs and hats. Many praised the variety of shopping options. Campus Stores Director Andy Dunn said the place had been “rocking and rolling.” Check it out, shoppers. Notice anything different on Interstate 17 next to Grand Canyon University’s 27th Avenue office building? Something big and purple? It’s the University’s cool-looking new billboard, which became fully operational this week. From baby bibs to iPad bags, more than 1,200 items of Lopes merchandise will be on sale when the new GCU Lope Shop opens for business this week on Lopes Way. About 99 percent of the merchandise is new, including a pet wall filled with leashes, bandanas and portable purple pet bowls. 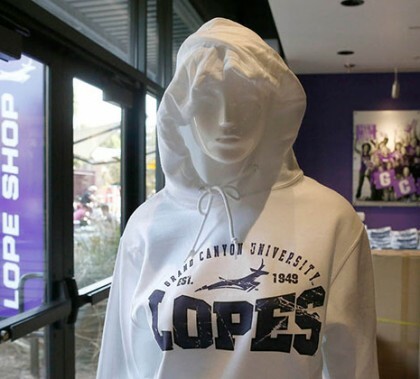 Sweatshirts and T-shirts abound in cool colors and bearing the sleek Lopes logo.